We help to improve the life chances of children in care by strengthening the links between children's needs, the outcomes being pursued, and the financial resources available. Children and young people in care achieve their best outcomes when Children’s Services Departments tailor support to meet each individual’s unique needs. 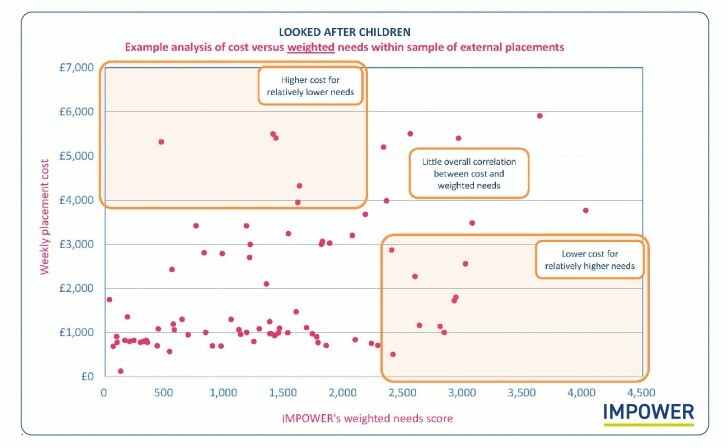 However, IMPOWER’s analysis has shown that the links between needs and spending levels are weak, and there is often no evidence that the best outcome has been delivered. While this is clearly not intentional, social workers, professionals and service providers have no shared language to describe the complex requirements of children and young people in care, and without a true understanding of needs, some children are left with no carers or placements. A new approach is needed. IMPOWER’s Valuing Care programme helps councils to improve the life chances of children in care (looked after children) by strengthening the links between children’s needs, the outcomes being pursued, and the resources available. By better capturing and reviewing the needs of looked after children, councils can make better decisions on support, placements and commissioning. We developed Valuing Care to complement existing assessment tools, working across different council service to co-produce a needs and outcomes profiling approach. Following assessment by social workers and other professionals, we then map the placement cost of every child in a council’s care against the needs of the individual child or young person. From the example below, it is clear that there is no correlation between costs and needs. Some children with low needs have expensive support packages, and other children with much greater needs have less expensive support. By mapping all children in this way, councils are able to demonstrate transparency and fairness over how resources are used across the system, and to make better decisions on support, placements and commissioning. Our Valuing Care approach enables councils to bring greater transparency and fairness to the way resources are used by their Children’s Services Departments. This improves the life chances of children in care and ensures that every pound spent makes a positive difference. Apply behavioural insight to support the required change in culture. “Valuing care gives us a tool to describe and quantify need. It looks across the whole child rather than focusing on particular, usually narrow, areas of risk. It will, over time, help us evidence reduced need, hopefully across all our outcome domains. “Through this project we’ve seen the importance of changing the way that social workers, commissioners and providers think about and approach providing care and support to children and young people. The tools and methodology developed through Valuing Care give us the means to capture and use intelligence about our children in a different way. We recognise that many providers have already established systems for needs assessment, allocation of support, and measuring outcomes. However, we believe that unless such an approach is applied universally, the impact will be limited – there will continue to be children and young people who cannot be placed, and sub-optimal placement decisions being taken. Local authorities must address this, and most importantly, they must work with providers to do so. This isn’t about reducing prices; it is about improving the matching of placements, reshaping the market to meet need, and enabling both providers and commissioners to increase the positive impact of achieving outcomes. Provides an opportunity to learn ‘what works’ more broadly across the sector. Provider participation is a vital part of the Valuing Care programme and we would welcome your feedback and involvement. To get involved or share your views, please contact us. Shining A Light volume 3: Are we valuing care?